8in1 Perfect Coat Bath Wipes Puppy are the in between baths cleansers to keep your puppy clean and fresh anytime of the day. These wipes are enriched with moisturizing conditioners to keep your pet fur shiny and nourished. They are made from soft material that's gentle on skin and keeps pet's skin free from allergens. These wipes keeps your pet clean and healthy in between their bathing sessions. The aloevera soothes the fur coat and make the skin healthy and shiny. 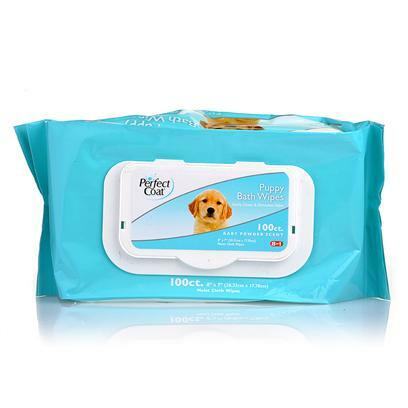 A Closer Look: 8in1 Perfect Coat Bath Wipes Puppy is a perfect blend of moisturizers, cleansers and deodorant that can keep the coat of your pet clean, conditioned and smelling nice. These wipes are alcohol free and contain aloe vera extracts and lanolin which keeps your puppy groomed.